India’s indigenously developed nuclear warhead-capable long-range ballistic missile Agni-V today completed yet another successful trial and is now inching towards induction. Today’s was the sixth successful trial and the second this year. The missile was fired from Dr Abdul Kalam Island (formerly known as Wheeler Island), off the Odisha coast at 9:45 am. “All the mission objectives have been achieved,” the Ministry of Defence (MoD) said in a statement. “The trial was a total success as the missile hit its target with pinpoint accuracy after covering its full distance,” a news agency said while quoting unnamed sources. 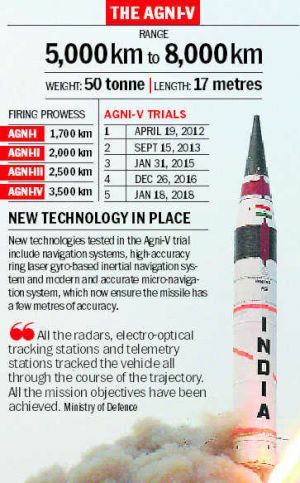 The Agni-V missile has a range between 5,000 km and 8,000 km. A nuclear warhead-carrying missile that can go beyond 5,500 km is classified as inter-continental ballistic missile (ICBM). Indications are that the missile — weighing 50 tonne, with a length of 17 metres and having the capability to carry a 1.5-tonne nuclear warhead — could be inducted after a possible final trial. The outcome of any future test and its conduct over the next few months would determine induction of the missile. An early induction could add a feather to Prime Minister Narendra Modi’s cap as his government would be seeking a re-election in less than 12 months. Group Captain Ajay Lele (retd), senior fellow at the MoD-backed think tank Institute for Defence Studies and Analyses (IDSA), says, “India is slowly inching towards adding the Agni-V missile to its nuclear triad.” Group Captain Lele is part of the IDSA’s Centre on Strategic Technologies. He said the series of trials were part of the process for the Agni-V missile development. Once inducted, the missile will match China’s Dong-Feng series and propel India into a exclusive club of nations possessing missiles than can hit target at a range of more than 5,500 km. Besides China, the US, Russia, France, Israel and North Korea are the other nations with such capability. The Agni-V missile has been tested five times earlier, the last being on January 18 this year. India has also narrowed the gap between the conduct of two tests as today’s came only 135 days after the previous one.